TapSnap celebrated the US Open Golf Tournament in style with a two-day Golf Channel party at the xfinity Live! dining and entertainment venue in Philadelphia on June 14 and 15. Everywhere you looked there was golf. On Friday, it was a post-work event for the adults from 4 to 8pm, with play from the Merion Golf Course being broadcast on a multitude of TV screens small and large throughout the venue. TapSnap was set up in the middle of the vast entertainment complex, an open-concept area of bars and restaurants. Guests could choose from two US Open backdrops. 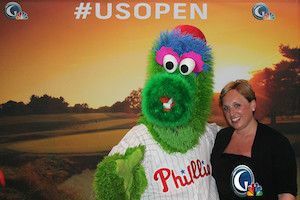 “Everyone had a great time pretending they were getting their picture taken at the US Open,” said Ellyn Cohen, the VP of Sales for the TapSnap franchise in Philadelphia. 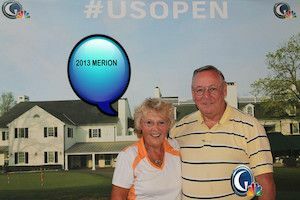 Event guests also had a chance to win golf prizes including free US Open tickets, and play the Merion on a simulator. Also on hand was the Phillie Phanatic, the green mascot of the Phillies major league baseball team, and various Golf Channel broadcasters. And there was a great take-away. Being that the next day was Father’s Day, guests had the chance to use TapSnap to produce their own customized Father’s Day cards. The Golf Channel even gave away frames for the TapSnap photos. “The Golf Channel did a Google search and they found us thanks to TapSnap’s AdWords program,” said Cohen.